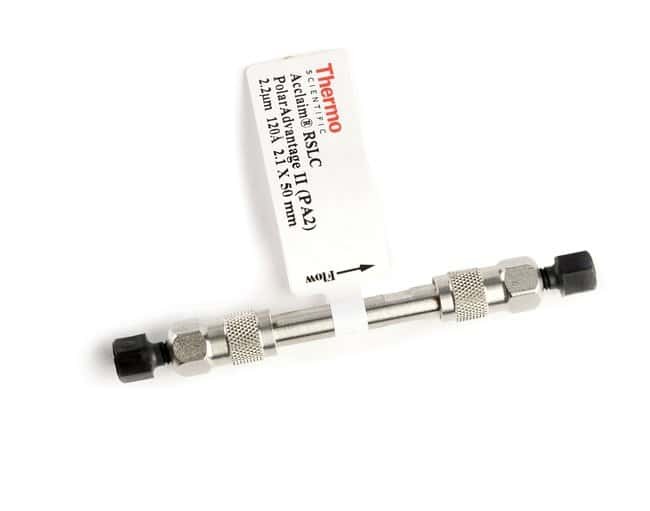 Improve the separation efficiency in your reversed-phase applications with Thermo Scientific™ Acclaim™ 120 C18 columns. These columns feature an ultrapure silica substrate with extremely low metal content to minimize tailing effects and deliver symmetrical peak shapes. The unique bonding chemistry yields excellent surface coverage to provide highly predictable separations that are unaffected by secondary interactions. Use these high-efficiency columns for maximum resolution in a wide variety of applications. Achieve the high standards set by modern HPLC and LC/MS methods with the Acclaim family of reversed-phase columns. These silica-based columns with advanced column bonding and endcapping technologies provide complementary selectivity, high column efficiencies, and ultra-high resolution for a wide variety of applications.